Mage Knight Unlimited replaces Rebellion as the introduction to the Mage Knight universe and game. This set uses the same fast and fun rules so the new figures are fully compatible with others. Each of the 160 different characters are mounted on combat dials that includes all its powers and abilities. No more looking in long rule books or referring to charts! These pre-painted and fully assembled figures are part of a complete game that is easy for new players to grasp, but allow for sophisticated strategies. Mage Knight Unlimited contains a mix of figures from the Rebellion and Lancers sets, including 24 resculpts and 16 brand-new and beautifully sculpted Unique figures with new game stats. Everything needed to start playing is included. 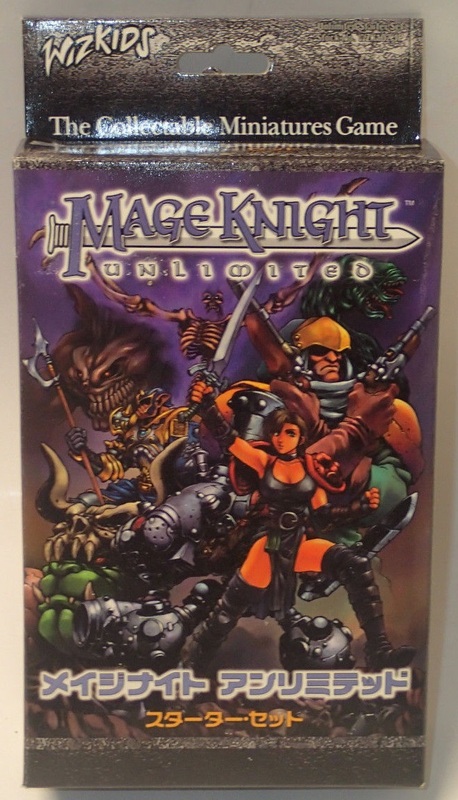 There was also a Japanese edition of the Unlimited Starter Set that was released. Pyramid was not a true expansion but a new starter set for the Mage Knight Dungeons game. Like Dungeons, all figures are compatible with regular Mage Knight play. Minions featured more Solonavi and Draconum figures, including the first non-unique Solonavi figures and the first dual faction Draconum unique figures. In addition, the Tough versions of the first 10 figures in the set were made in limited edition glow-in-the-dark plastic variants, randomly inserted in boosters.